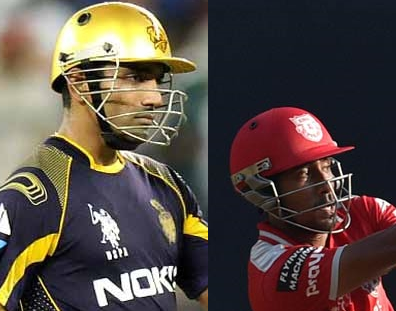 The Super Wednesday saw Kings XI and Kolkata Knight Riders marching ahead with comfortable wins over Sunrisers Hyderabad and Mumbai Indians, respectively. While Hyderabad hosted 200+ chase, Kolkata saw a clinical win in below 150 score as both teams chased in 18.4 overs. Still, the remarkable aspect of the day was the quick big knocks by Indian local players. First Naman Ojha for SRH, then Manan Vohra and Saha for Kings XI massacred the bowlers, and then Uthappa for KKR played a memorable match winning inning. High score also saw Sandeep Sharma creating a dubious record, while Steyn reaching half-century of conceding runs at Hyderabad, whereas spinners Harbhajan Singh, Shakib and Narine had a successful outing at Kolkata. Practically the day also knocked out Mumbai Indians out of contention. First time Sunrisers Hyderabad crossed 200 runs in their IPL innings. 36-ball unbeaten 79 runs by Naman Ojha (7 6s 4 4s) was the pick of the innings as he feasted on Indian counterparts, Shivam Sharma, Sandeep Sharma, Dhawan and Akshar Patel of Kings XI. He was supported by Shikhar Dhawan (37-ball 45 runs) and Warner (23-ball 44 runs). In their big hitting that got them 12 6s and 14 4s, Sandeep Sharma had a figure of 1/65, which makes him the owner of second worst bowling performance in an innings in IPL. Any other team would have had to sweat to even think about the chase. But Kings XI are determined to make others only sweat became the king of high chases. They needed only 18.4 overs to score 211/5 runs. Sehwag could play only 2 balls, but Manan Vohra playing after warming the bench for 10 matches, despite being retained, and Saha batting at No. 3 made the most of the opportunities. They needed only 7.1 overs to add 91 runs as Kings XI reached the fastest 100 of IPL as they got there in 7.3 overs with a six by Maxwell. Saha (26-ball 54 runs with 8 4s 2 6s) was stump on the bowling of Karn Sharma. But Karn will regret it forever as Maxwell then hit him for 3 sixes in the same over. VOhra (20-ball 47 runs with 5 4s 2 6s) was run out and the score read 125/3 in 9.1 overs when Miller joined Maxwell, who scored 22-ball 43 runs (2 4s 5 6s) and Mishra got him. The socre was 159/4 in 13.1 overs. Remaining runs were scored comfortably by Miller (run a ball 24 runs) and Bailley (19-ball 35 runs with 3 6s and 2 4s). B Kumar finally became victim of slog hitting as he conceded 38 runs for wicket of Sehwag. Steyn’s poor form continued with 0/51. Karn Sharma (1/46) was picked by Maxwell. Henriques (0/36 in 2 overs) had the same fate. Only Amit Mishra (1/32) had a comparatively less tormented evening. Surprisingly, Dhawan used Irfan Pathan only for one over that too in 17th over (0/5), despite all bowlers getting hit. Mumbai Indians were sent to bat first and they could reach only 141 runs despite losing only 5 wickets. Simmons (12), Gautam (8) had a poor opening. Rayudu (27-ball 33 runs) and Rohit Sharma (45-ball 51 runs) got some runs on board. But ANderson (12-ball 18 runs) and Pollard (11-ball 10 runs) could do explode against discipled bowling of Narine and Shakib. Narine (1/18) and Shakib (1/21) were the best bowlers of the day. Morne (2/35) was effective but expnsive. Umesh had 0/24 in 3 overs, while Chawla had 1/32, and Yusuf 0/10 in 1 over. In reply Gambhir (18-ball 14 runs) and Uthappa (52-ball 80 runs) started with 4th consecutive half-century partnership. Pandey (21-balll 14 runs) also strugglled, but Uthappa was single-handedly enough to chase. Although Shakib (9 runs in 8 balls) became a victim of Malinga, Yusuf Pathan finally stayed on the pitch and hit the winning runs scoring 13-ball 20 runs. Harbhajan Singh with 2/22 was the third bowler of the day to concede less than 6 runs per over. Malinga (1/30) was hit as well as Simmons (1/34 in 3 overs) and Bumrah (0/23 in 3 overs). Pragyan Ojha (0/25) was also economical but there was hardly any runs on board to defend. Both had been playing useful little knocks and shuffling their positing in the batting line up. With some stability they exploded today. First Saha played probably the innings of his life as his qquickfire half-century helped Kings XI create a new record for scoring fastest 100 runs by any IPL team and thereby easily chasing 205 runs at Hyderbad. Then Uthappa finally scored big hitting 80 runs that made his team win easily. IPL 2014: Is CSK Already in Semifinal! !